The hallmark of state economic regulation is the purported protection of the viability of essential services by restricting competition. In the mid-19th century, the American Congress enacted economic regulations aimed at protecting the horse-drawn stagecoach industry from competition by the railways. Government officials imposed higher freight rates on the railways that subsequently saw an increase in their profits during a time of economic expansion. Despite state economic regulation, ongoing innovation in transportation technology led to the extinction of the horse-drawn stagecoach industry. For many years, Canadian federal government officials similarly “protected” the viability of Atlantic Canada’s codfish industry through fishing quotas and regulation. Numerous so-called experts with doctorate degrees advised and guided federal officials in regulating the codfish industry to assure the viability of the industry and a perpetual supply of cod. Despite this regulation, Atlantic Canada’s codfish industry collapsed due to the so-called perpetual supply of cod having apparently vanished from the ocean off Canada’s east coast. Following the Atlantic codfish debacle, parts of Atlantic Canada began to show signs of economic recovery following the discovery of oil and natural gas off the coast of Newfoundland and Nova Scotia. Private entrepreneurs across the region opened businesses in several other sectors of an economy that began to show some promise for the future. 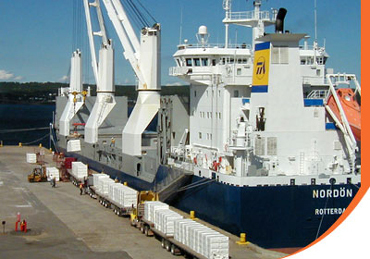 More recently, ongoing developments in the world of international maritime transportation have offered a possible economic development opportunity to Atlantic Canada in the form of a new deep seaport, which could come to fruition courtesy of private sector investment. The construction of the St. Lawrence Seaway was the last major development in Eastern Canadian maritime transportation and was funded by government. When it first opened, the biggest ships on the ocean could sail on to Lake Ontario and the Port of Toronto, also to ports on the Upper Great Lakes. Then overseas shipyards started building longer, wider and deeper-draft ships that could not sail along the St. Lawrence Seaway. Despite the biggest ships no longer being able to reach Toronto, that city continued to maintain its status as an international centre of commerce and business. The steadily increasing size of ships prompted the Government of Panama to enlarge the Panama Canal to transit longer, wider and deeper-draft ships known as “post-Panamax” or “New Panamax” ships. Unfortunately, the historical precedent of the St. Lawrence repeated itself as Asian shipyards designed and built ships that are too wide, too long and too deep to transit the new and enlarged Panama Canal. The list includes the “Valemax” bulk ship, the Emma or E series container ship and the Triple-E series container ship, all of which are also too large to sail the St. Lawrence River to Montreal. But these big ships can fit into an almost hidden little oceanic channel located in Atlantic Canada known as the Strait of Canso. This is the location where a private company has proposed to build a terminal using private capital for ships that are too wide, too high or too deep to sail up the St. Lawrence River, which has a navigation draft of 10 metres and a maximum allowable navigation beam of 44 metres. The class E series, Triple-E series and Valemax ships are built to navigation beams (widths) of 56, 59 and 65 metres. A fully laden Triple-E ship measures 73 metres from under its keel to its upper level while a Valemax ship converted to carrying containers would measure 80 to 90 metres of vertical depth. There is 40 metres of vertical clearance above the river under bridge over the St. Lawrence River west of Quebec City, with 10 metres of depth for a total vertical elevation of 50 metres. Even the New Panamax ships that can transit the enlarged Panama Canal are too deep to sail the St. Lawrence River at full load, but may partially offload cargo at a future deepwater terminal at the Strait of Canso. However, there is opposition to the construction of such a port from officials from communities located at a distance from the Strait of Canso, who allege that the port would cause a loss of jobs in their communities. Of course, given that long-term economic forecasting is often flawed, the forecast of possible job losses at locations far from the site of the proposed port may be mistaken. Local officials from the outlying areas have even applied to Canada’s federal transport department to act as regulator to restrict development of a deepwater port in the Strait of Canso. In his treatise on Entrepreneurship and Innovation, management expert Peter Drucker presented the example of the introduction of the Boeing 707 to trans-Atlantic service. All the “experts” claimed that the trans-Atlantic passenger transportation market was too small to warrant such a technology, given that the trans-Atlantic ocean liners were sailing at part load. But within ten years of its introduction to service, some ten times as many people were traveling the northern trans-Atlantic route. The so-called “experts” based their conclusions on data from an existing market and their methodology proved to be flawed. Transport Canada’s consultants and the opponents of the Canso super port are using the exact same methodology, evidently oblivious to the possibility of a hidden and untapped market such as the one that traveled aboard the Boeing 707 aircraft. Officials at Transport Canada would have a high propensity to consider only data from the existing local maritime transportation market while totally ignoring the possibility of a hidden and untapped maritime transportation market. As a result, they are prone to repeating the debacle that federal officials caused with Atlantic Canada’s codfish industry. But with any luck, Federal officials will give private enterprise the freedom to develop a deepwater terminal at the Strait of Canso using private funding. Unencumbered by politically motivated restrictions, port management could compete for business in a future untapped and hidden maritime transportation market. A post-Panamax ship carrying some 5,000 containers to eastern Canada could partially unload at a port at the Strait of Canso so as to be shallow enough to sail the St. Lawrence River to Montreal. The port’s hidden and untapped maritime market would lie outside of the partial unloading of New Panamax ships that arrive there. A ship owner may convert a Valemax bulk carrier ship to carrying from 10,000 to 14,000 20-ft containers (TEU’s) between Asian and South American super ports. While no terminal on the east coast of Canada or the USA can currently accommodate such a large ship, a possible future super port built in the Strait of Canso could become the only east coast port able to do so. Inland ships that sail the St. Lawrence Seaway and coastal ships that sail the American east coast could interline with an oceanic mega-carrier at a port at the Strait of Canso. However, federal officials may be tempted to impose economic regulation on a future deepwater port at the Strait of Canso, purportedly to protect the equivalent of a horse-drawn stagecoach industry at some other distant location. No big ships presently arrive at such locations and no containers are being transferred in the area. While port opponents may have no credible case to present, they may seek to have Transport Canada impose federal economic regulations to restrict the port’s future success for purely political purposes. After all, the port might become too successful if it were to operate free from governmental economic restraint.